For more movie summaries, see Kam's Kapsules. DREAMING UP A GET RICH QUICK SCHEME AT WORK: Ralph Cramden (Cedric the Entertainer), while concentrating on driving his bus at work, is thinking up another scheme that he is sure will make him rich. end caption. Anyone expecting this adaptation to measure up to the classic television series should pass on this remake, which was designed to appeal to a young audience. The elements which made the original series so memorable: the poignant thread of social realism running through the core of the story, the witty repartee among the characters, and the chemistry between the actors  all of which made the program timeless  are missing. The Honeymooners debuted on television in 1950 as a sketch on the Cavalcade of Stars before being expanded five years later into a 39-episode sitcom for one season. Performed live, without retakes, the show starred Jackie Gleason as Ralph Cramden, a short-tempered dreamer who tested the patience of his spouse, Alice (Audrey Meadows). She endured the domestic drudgery of life in a tiny, drab apartment while waiting for one of Ralph's hare-brained get-rich-quick schemes to pay off. Art Carney and Joyce Randolph co-starred as Ed and Trixie Norton, the Cramden's best friends and neighbors. 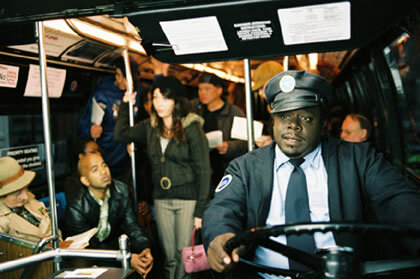 The movie The Honeymooners, directed by John Schultz (Like Mike), bears a superficial resemblance to the television series, however, the principal cast is black, featuring Cedric the Entertainer as bus driver Ralph, Mike Epps as sewer worker Ed, and Gabrielle Union and Regina Hall as Alice and Trixie, respectively. The four reside in a broken-down, Brooklyn walk-up where the husbands are constantly cooking up cockamamie ways to make a quick buck, much to their level-headed wives' chagrin. Visually the picture fails to convey an authentic feel of New York City, except in a couple of early scenes: one, when we find Ralph's bus careening down Broadway, and another, where he's wooing Alice below the Brooklyn Bridge with a full moon hanging over the Manhattan skyline. Otherwise, the locales seem oddly antiseptic, as if they might be Hollywood sets, despite the tenement fire escapes and screeching elevated trains. Alice and Trixie, who both work at a diner, have their hearts set on buying a duplex provided they can raise the down payment before a real estate developer (Eric Stoltz) convinces the elderly owner into selling it to him. Ralph and Ed fritter away their savings on ill-advised investments such as a Y2K Survival Kit, a Pet Cactus, a velour fanny pack, break dancing, metal detectors, mislabeled Mets merchandise, a Kangol umbrella cap, a Pullman railroad car, a paper delivery route, and lottery tickets. Worse, they occasionally cross moral and legal lines when they pretend to be blind beggars or when they collect funds for a bogus charity. However, none of the above antics is developed any deeper than is necessary to trigger a quick laugh. The only subplot with any depth involves an abandoned dog found in a dumpster. Ralph and Ed decide to enter the greyhound in a $20,000 race and hire John Lequizamo, a street hustler, to train the dog. Dodge's irreverent asides provide the movie's funniest moments, and they also set a distinctly different tone. It's unfortunate that it only takes a few lines of crude dialogue to spoil a children's movie which could have worked just as well clean. Although this film fails to measure up to the television show, I feel comfortable recommending it as light family entertainment.The picture is a disconnected series of skits and one-liners, which will probably satisfy children, but infuriate adults looking for the nostalgia of the sitcom. Good (2 stars). Rating: PG-13 for sexual innuendo and crude humor. Running time: 85 minutes. Studio: Paramount Pictures.